Illinois makes strides in connecting uninsured and former justice involved with coverage. But large hospital bills and complicated billing practices still make access to care a challenge and financial risk. 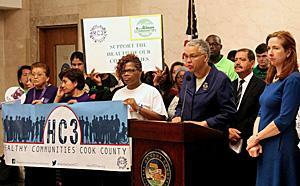 Cook County is set to begin offering care to uninsured residents. The initiative, announced at a press conference September 14, will provide eligible residents with a membership card, a handbook and an assigned "medical home." Residents earning up to 200% of the federal poverty level who do not quality for public insurance, including current CareLink's (a financial assistance program for the uninsured) current 40,000 members, will be eligible. Nearly a third of patients seen at Cook County Health and Hospitals System facilities are uninsured, down from 55% prior to the ACA. The county is home to most of the estimated 900,000 Illinois residents who remain uninsured because they are unable to afford commercial plans despite employer or federal subsidies, because they have not yet been enrolled in a public health plan for which they are eligible, or because of their immigration status. The CCHHS is developing an operational infrastructure for the program, which is expected to start in early 2017. The initiative received support from President Toni Preckwinkle, several commissioners, and the Healthy Communities Cook County Coalition, known as HC3. The State of Illinois has now gone more than a year without paying bills it owes to health care providers, resulting in a backlog that had topped $3.5 billion by August. The unpaid claims are for care provided to state workers under the State Employee Group Insurance Program. They could soon have an impact, Dan R. Long told downstate newspapers last month, as hospitals and other providers attempt to recoup their losses via price increases. 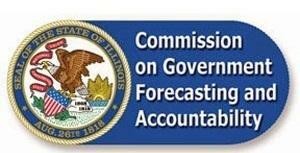 Long is executive director of the Commission on Government Forecasting and Accountability, which is charged with monitoring economic trends and making fiscal recommendations. The stopgap budget measure did not alleviate the situation, as it lacked general revenue funds, which make up the largest revenue source for SEGIP; the backlog could reach $4 billion if a budget is not passed in November, Long said. 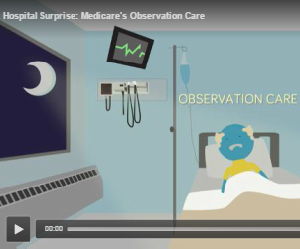 As watchers of our health care delivery system know, patients who are admitted to hospital can have an unfortunate Medicare billing surprise when they learn that they were only admitted "for observation" and not as official inpatients. Medicare classifies this observational status a form of outpatient care, and reimburses only at the latter rate - usually tiny fraction of the hospital's actual charge. Hospital Pricing Specialists, a Silicon Valley, Ca.-based health care research company, recently did its own research on the price tag for observational care in hospitals across the country. Among the Illinois rates, the most expensive - $2088 per hour at Holy Cross Hospital Chicago - was literally 100 times that of the least expensive - $26 at Decatur Memorial. (Nationally, the variation is even greater, ranging from $5 an hour to more than $13,600 among the 3,100 facilities studied; Chicago's Holy Cross was the the 13th most expensive.) The NOTICE Act, a long-awaited reform requiring hospitals to inform Medicare patients about their observation status and its potential financial consequences, was supposed to take effect August 6 but has been pushed back to late fall at the earliest. Inmates at Cook County Jail receive federally mandated health care, but it stops when they leave if they make bail or are released. So advocates decided the best place for ACA enrollment intake at the jail itself. As of September 2015, more than 12,000 people, had obtained health insurance via the Justice and Health Initiative, a project of the Treatment Alternatives for Safe Communities, State's Attorney's office, Sheriff's office, and the county health system. The Illinois Health Facilities and Services Review Board has approved Cook County Health & Hospitals System's Certificate of Need application to construct a new Central Campus Health Center. The $137 million, nine-story outpatient facility will expand outpatient services, including a women and children's health center. Last month, the Galesburg Register-Mail ran a two-part series on police response to mental health-related calls. It made the point that the police department has no plan for dealing with involving mental health situations they are called into, a situation that is aggravated by the ongoing budget impasse. The stories were by cops and courts reporter Robert Connelly. Should housing be a #Medicaid benefit? This new study argues that doing so would improve access to care http://bit.ly/2delLZB "Reducing Homelessness by Embracing Housing as a Medicaid Benefit"
Enrollment is coming up on Nov. 1 and there is a major push to insure more young adults http://on.wsj.com/2daLia3 "Health-Insurance Push Targets Young Adults"